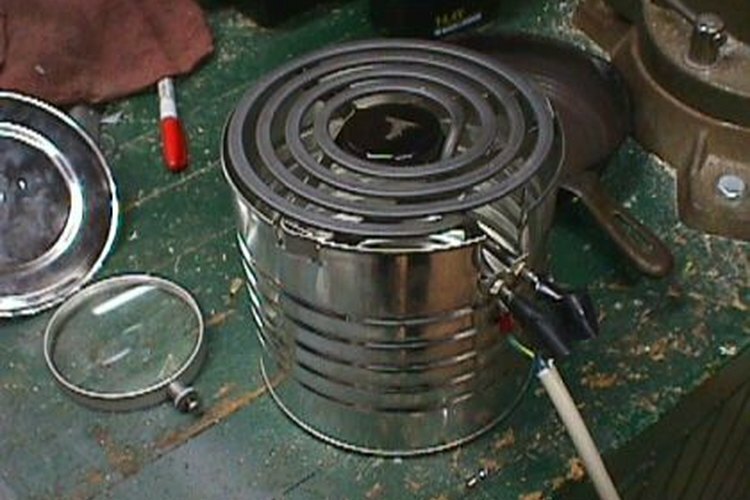 The coffee can stove is easy to make and effective. The coffee can stove is an artifact of a bygone era. When the Great Depression hit and millions of people were without jobs and suffering the consequences of food shortages, many were homeless, wandering in search of a better job or warm meal. Many wanderers needed a way to cook their food and warm themselves but were without the resources to buy a new stove. Many people just made their own. One popular and effective stove type is the coffee can stove. You too can build this effective little stove, simply by following these instructions. Use the can opener (one of the old-fashioned punch-style kinds with a bottle opener on one end) to make eight evenly spaced holes around the bottom of the can (which will become the top of the stove). These will act as smoke holes and allow the smoke from the burning tinder to escape. It also helps to vent the inside of the stove and allow oxygen to fuel the fire. Cut a square 4-by-4 inch door from the top of the can (which becomes the base of the stove). Drill two small holes on either side of the hole. Screw the metal screws into the holes and wrap the ends of the coat hanger around each screw. Bend the edge of the 4-by-4 inch piece of metal you cut for the door over the wire to create a swinging "damper door." Turn the can over and set it on the ground. Load wood through the small damper door and adjust the amount of oxygen by opening or closing the same door. Your stove is complete. Coffee can stoves can be fueled by wood you find at your campsite or by many of the canister-style fuels now available for backpacking. Only use pencil-thin sticks as kindling for this stove as it is easy to use too much wood and overcook your food.